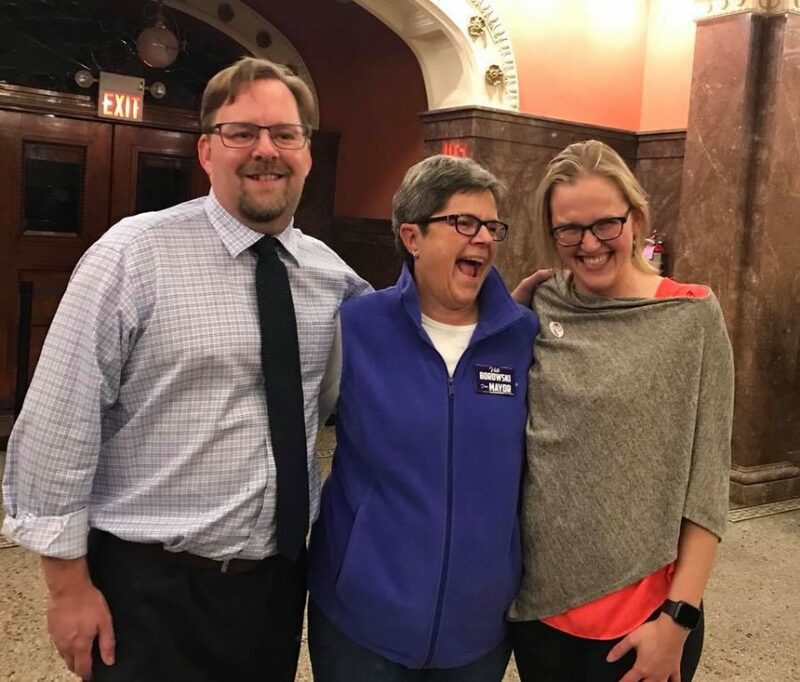 Ross Hadley (‘95), Lorraine Borowski (‘70), and Johanna Bergan (‘08) celebrate after election day. Three Luther College alums were elected into Decorah’s public office on Nov. 7. Lorraine Borowski (‘70) beat twenty-year city council incumbent Gary Rustad to become Decorah’s first female mayor. Johanna Bergan (‘08) was elected to represent Ward 5 and Ross Hadley (‘95) was elected to Decorah’s at large City Council seat. Before announcing her bid for mayor, Borowski served as the Director for Decorah’s public library for 27 years. Borowski believes that her time as director made her a viable candidate for mayor. Borowski described the mayoral role as a mediator in city council meetings and a representative of Decorah throughout Iowa. “I do not have a vote and I do not break any ties [in City Council],” Borowski said. “I do have veto power, if I choose to use that. That is used very seldom, but it is a type of checks and balances. My main task is to oversee the city council meetings; any type of special meeting that would come about; and I also represent the city in whatever would need to be represented whether that be the local, county, or state level”. Borowski said that the current political situation on the state and federal level poses challenges for Decorah, which contributed to her decision to run for mayor. “We have a lot of things we want to do. There’s going to be less revenue coming down at the national and state level, so it really is important that we have a sustainable economic base to support the city,” Borowski said. Hadley, who owns Amundson’s Clothing and The Good Foot in downtown Decorah, focused his campaign around economic issues. Hadley decided to run for the at large city council seat because he saw it as an opportunity to represent Decorah. Hadley also wants Decorah to become more environmentally friendly by having the city council implement sustainable policies. While Bergan ran on similar platforms to Borowski and Hadley, she also felt compelled to change the structure on Decorah’s city council. Bergan stressed the importance of women leadership in politics and wanted to set a precedent for more women to run for public office. Alex Sekora (‘18) expressed his contentment with the three newly elected Luther alumni in Decorah’s public office.